In this blog post our Barnstaple dentist takes a detailed look at dental cavities and fillings. A dental cavity forms when the outer surface of your teeth are attacked by acid excreting bacteria. The bacteria excrete acid as they digest sugar in your diet. The cavities can become larger as more bacteria sit in the cavity, excreting more and more acid. In the beginning small cavities may have zero pain as they are in the outer surface of the tooth, but as they deepen and get closer to the nerve your teeth may become more sensitive or even painful whilst eating or drinking, particularly hot or cold food/drink. This deteriorating process is known as a dental decay. A filling is simply filling up this cavity with a suitable material, your dentist will remove any decay and then fill the cavity back up to the original contour of the tooth. What do they fill cavities with? The philosophy of the dental practice, some practices prefer not to use mercury containing amalgam. What is a filling made of? Depending on the criteria listed above there are a variety of filling materials which can be used. This is a malleable metal alloy containing mercury. It has been shown to be extremely durable as a dental filling material and lasts many years. It does not however look particularly attractive. Gold is virtually inert and is very well tolerated by the body. It’s highly polished surface also very closely matches the surface of dental enamel when viewed microscopically. This means it does not wear the opposing teeth and can be considered a highly biocompatible material. Many people like the look of gold, it does not however look particularly natural and some people prefer to have a more natural looking filling. Dental porcelain is made by combining various minerals with quartz, effectively making dental granite, an extremely hard and durable material! The porcelain is naturally tooth coloured and can be made highly aesthetic to blend in with the surrounding teeth. A porcelain filling will be made by a dental technician; this adds time to the procedure which means a porcelain filling often takes two weeks to complete. Your dentist can also use a tooth coloured composite material to pack into the cavity once the diseased area has been removed. This has the advantage of being highly aesthetic and also highly convenient as it can be placed in one appointment. Dental bonding does however tend to discolour over time so may need to be replaced more often. Either your dentist or you notice the cavity and decide to take action. A discussion is had as to the best material to use clinically, there may be a few options which can be discussed that have different prices. A decision about the material is made, based on this decision the dentist will prepare the cavity accordingly. Some materials require specific shaped cavities in which to fit and so your dentist will prepare the cavity in the correct way. If you are having a direct dental bonding them the composite material will be placed directly, if not your dentist will take an impression of the prepared cavity, place a temporary filling and send this impression off to the dental laboratory to have the new restoration manufactured. If you had a dental bonding composite filling then step 4 would have been your last stage, if a dental laboratory is manufacturing your filling then this will be returned approximately 2 weeks later and you will visit the dentist to have this fitted. A review of this filling will take place at your six monthly check-up at the dentist. There are cavity filling kits available in various pharmacies and online. They may seem like a cheap and convenient option however they should never be used as a permanent solution. Home kits may well fill the cavity however the chances are you will be filling over bacteria which will continue to cause dental decay underneath. This means you may not notice this decay until it has reached the nerve of your tooth, by which time more expensive dental procedures may be required. If you need to use a tooth cavity filling at home, consider this an emergency repair and always make an appointment to visit your dentist within the next week or so. clean your teeth twice per day for 2 min using a fluoride releasing toothpaste. Clean in between your teeth with an interdental brush or floss. Use a fluoride mouthwash after meals but NOT after brushing. Visit your dentist regularly as they will be able to detect the tiniest cavities in places that you cannot see. By doing everything you can to prevent cavities forming and then visiting your dentist regularly so that if there is any decay it can be dealt with quickly and simply, you can keep the cost of dentistry down and ensure you remain fit and healthy for life. Our North Devon based dentist is here to help you stay dentally fit for life, keeping dental decay and cavities to the absolute minimum. This entry was posted in Blog, Oral Health on 30th September, 2016 by Dr Donna Hill. Are Sports Drinks Destroying Your Teeth and a Risk to Your Health? Some recent research from the University of Cardiff showed that of the 160 children that responded to their survey 89.4% of them stated that they drank sports drinks with half of them drinking them at least twice a week. These drinks are intended to improve performance and keep athletes hydrated and are not intended to be drank as recreational drinks, especially by young people. Drinking these drinks has been marketed as being fashionable, trendy and often healthy which has led to a surge in popularity amongst the younger members of our population. The main reasons for consuming these drinks was attributed to the nice taste (90% of respondents) With 80.4% of respondents purchasing the drinks from local shops. 77.9% of boys came to drink sports drinks during physical activity whilst only 48.6% of girls claimed the same thing however, more girls claim to drink socially, 51.4% compared to 48.5% for boys. Alarmingly, a study reported in the independent.ie says that 55% of the sports drinks consumed at home rather than during any exercise at all! The problem is not the sports drinks themselves, the problem is the fact that these drinks are formulated for enhanced exercise performance. The sugar in sports drinks is there to give fast absorption of carbohydrate so that the muscles can run at peak performance. Yet if these drinks are consumed with out the physical exercise then the body is not using the sugar in this way. Lucozade sport, for example Contains 27 g of sugar or 7 teaspoons worth in a 750 mL bottle. The world health organisation recommends people consume a maximum of 50 g of added sugar per day, meaning one bottle of Lucozade sport is more than 50% of your daily recommended intake. The government’s recent launch of their Change4Life campaign of the Sugar Smart app goes a long way to helping children understand how much sugar is contained in various drinks, because this is an app, children find it more interactive and a useful way to scan their favourite drinks to see how much sugar is included. What are the risks to your dental health of too much sugar? We’ve written in other blog posts about the effects of too much sugar with regards to diabetes and obesity but there are also risks to your dental health. Dental decay is caused by the acid excreting from the bacteria in your mouth, these bacteria feed prolifically on the sugar in your diet, the more sugar you have, the more they feed on the more acid they excrete. In the most part your saliva neutralises this acid but it can only work to a certain degree, too much acid and it attacks your teeth and causes dental decay. One of the biggest problems is that these bacteria lurk in between your teeth which is notoriously difficult to clean, this is why using an interdental brush or floss is absolutely vital for maintaining your dental health. Tt is fairly easy to limit the amount of added sugar that you put on food, more difficult is being aware of the sugar that you don’t know you are eating. It’s important to doublecheck things like sauces, dressings, cereals plus prepackaged food like soup and ready meals. Fizzy drinks contain a huge amount of sugar, a 500 mL bottle of cola contains the equivalent of 17 cubes of sugar. Even when you drink fruit juice you are still consuming a large amount of additional sugar. Consider sweeteners in moderation instead of adding sugar. Remove the temptation of adding sugar by not putting it on the table in the first place. Remember, syrup and honey also contain sugar, so keep these safely in the cupboard also. Enhance your food with spices instead of sugar, things like ginger, cinnamon or nutmeg can add interesting flavours without adding sugar. Purchase sugarfree drinks or get into the habit of drinking water, perhaps with a slice of lemon or lime to give it a fresh taste. When baking reduce the amount of sugar in the recipe by up to 1/2, often you won’t notice any difference. If you purchase tinned fruit, make sure it is in water or natural juices rather than in syrup. If you like sugary cereal, rather than add sugar, experiment with different fruits such as bananas, cherries, strawberries or dried fruits such as apricots, raisins or cranberries. This entry was posted in Blog, Oral Health and tagged dental decay, dental health, fizzy drinks, sports drinks, sugar on 5th September, 2016 by Dr Donna Hill. It is unfortunately quite common for people to have missing teeth, many times nothing is done and people live quite happily with the gap, in this blog post we will look at some of the reasons why you may want to replace missing teeth and if you so choose, what are your best options? We’ve written in a previous blog post that when you have a missing tooth the opposing teeth can begin to drift and the adjacent teeth can begin to tip, this is probably the biggest reason to replace missing teeth, in order to protect your surrounding teeth and bite. Options to replace missing teeth. You basically have three options to replace your missing teeth. A dental bridge essentially uses the teeth either side of the gap as a support to replace the missing tooth in the middle. One of the biggest disadvantages is that there is often a requirement to remove healthy tooth structure on either side of the gap in order to accept this new support. The support is called an abutment in technical terms and often takes the form of a new crown. The tooth which is replaced (called a Pontic in technical terms) is then attached to the abutments either side. You will generally find that to replace a single missing tooth that both teeth, on either side of the gap, are involved in this bridging process. This means that there will be a three tooth bridge required in order to replace a single missing tooth. The biggest disadvantage in this process is that possibly healthy teeth on either side of the gap may need to have healthy tooth tissue removed. Modern dentures can be highly asthetic so that no one would know that you are wearing them, the gum and acrylic teeth can be made to look highly lifelike and natural, mimicking a natural smile almost exactly. One of the biggest disadvantages of dentures is the fact that they are removable. Many people dislike the idea of removing their teeth at night. Gold. A more expensive option but an excellent material to use in the oral environment as it is inert and has good pliability. Acetyl resin. These are tooth coloured clasps, they often very expensive to make as the manufacturing process is relatively long and complex, they do however provide an extremely aesthetic option to retained dentures. A dental implant is often your dentist’s preferred option. When a dental implant is placed it will support the surrounding bone, this prevents the bone collapsing into the gap where the tooth was removed (remember to read our previous blog post on the subject). This means that bone is retained rather than lost after the extraction. It then but also means that the adjacent teeth do not have to be touched in order to take the abutment, as is common with dental bridges. This means that dental implants can often be the best biological, functional and aesthetic way to replace missing teeth. One disadvantage with dental implants is the immediate cost, there is the cost of providing the implant itself (this is a precision made dental appliance made to tolerances of thousandths of a millimetre), a dental implant surgeon to place the implant itself and then the final dental crown which is fitted on top of the dental implant. However, an extremely important point to bear in mind is that the dental implant will typically last longer than any of the other restorations. As your teeth and gums change shape you will be required to have a new denture overtime, with a dental bridge, the gum underneath the pontic (the new tooth) can change shape as it is not supported, as this happensgaps appear underneath this pontic meaning it needs to be replaced. Because dental bridges need three teeth to replace one single missing tooth, this can also be more expensive than you might imagine. For this reason dental implants are often considered the best option for you. If you want to have the simplest replacement of a missing tooth with the minimum number of appointments then a denture may be the best option. You do however have to consider the disadvantag that it is removable and will need replacing overtime. Next on this list would be a dental bridge. You will need a couple of appointments at the dentist but once the bridge is fitted you can forget about it, apart from cleaning regularly of course, although again you do need to remember that it may need replacing a few years down the line. Dentures would be the minimum cost way to replace missing teeth, apart from doing nothing at all. When it comes to dental implants and dental bridges it can often be a very close call. In the short term a dental bridge may be slightly cheaper but in the long-term, taking into account that a bridge may need to be replaced sooner than a dental implant, an implant can be the longest serving option. It’s also worth thinking about what your budget could be when you first go to the dentist. Remember, many dental practices offer payment plans, often at 0% so you will not always be expected to pay the full amount upfront. Please ensure you discuss this with your dentist if you think a payment plan could work for you. Trinity Dental Centre around local dental practice in Barnstaple, North Devon offering the local people dental health advice and treatments to help replace missing teeth as well as stay dentally fit and healthy for life. Request your appointment online today. This entry was posted in Blog, Replacing missing teeth on 4th July, 2016 by Dr Donna Hill. How Can the New Sugar Smart App Help You? It seems that, each day, many of us are eating too much sugar. You may be surprised to discover the amount of sugar you are eating and how quickly the added sugar that many of us consume can build up during the day. The government are now advising that parents take action by installing a new app onto their smart phone which is able to read the barcodes on many food products giving them a visual representation of the amount of sugar a product contains. 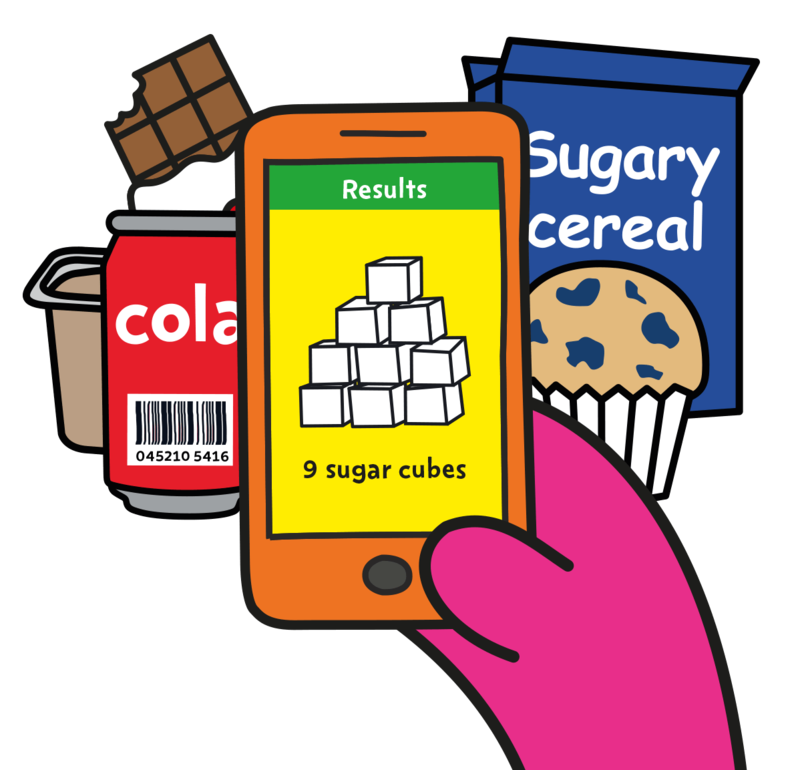 The “sugar smart app”, from Public Health England (PHE), functions by checking bar code scans and revealing total sugar content of the food in either cubes or grams. Authorities hope it can help combat tooth cavities, weight problems and type 2 diabetes and encourage families to select more healthy options with their daily diet. Approximately 46,500 children and young people under 19 were admitted to hospital for a primary diagnosis of dental caries in 2013–14 according to The state of children’s oral health in England report by the Faculty of Dental Surgery – that’s more children than were admitted for tonsillitis. As a nation, if we are going to reduce these hospital admissions for young people we need to get dental disease in our kids under control. Dental cavities arise when the bacteria in your mouth secrete acid. This acid secretion happens as they digest the sugar in your diet. This acid attacks the hard enamel of your teeth and can continue to penetrate deep into the tooth structure. If this acid attack is left unchecked then the tooth can become seriously infected. The only way to stop the dental cavity from continuing to grow is to visit the dentist, have the caries removed and then the hole filled. Advice on a good oral health routine can then be given as well as dietary advice. It is this acid attack which can be limited if we control the amount of sugar that we have in our diets. There are however other reasons to limit the amount of sugar. PHE states that young people are eating 3X more sugar than is recommended in their new Change4Life marketing campaign. Their research indicates that normally children aged 4 to 10 years of age are consuming 22kg of added sugar annually. That equates to about 5,500 sugar cubes which is more that the average 5-year old weighs! Download the application through the Apple Store or Google Play. Based on how old you are, your everyday sugar allowance will differ. The application informs you on the maximum you should eat. Select the product that has a barcode. Permit the application the use of the digital camera on your phone- a box will appear requesting permission. Line the barcode track up with the red-colored line and wait for a beep. If it’s doesn’t work, you may be trying to scan too close up, so move the camera further away. The application will let you know just how much sugar there is in the product – however the application does not have every food item available yet as it is still in it’s development stage. After that you can share the end result together with your connections on Facebook, Twitter, Google & other social media sites. Clicking the menu button gives you more about sugar content in meals, a scanning history and let’s you go to the app’s website. If you have children we can highly recommend that they download the app and begins scanning food, this can be a fun way to educate your case about the amount of sugar in food. Trinity Dental Centre is a private dentist in North Devon offering free dental health advice via their blog and social media streams. This entry was posted in Oral Health and tagged children's tooth decay, dental disease in kids, sugar, sugar smart app on 22nd January, 2016 by Dr Donna Hill. Why replace missing teeth? #3 Might Surprise You! We are often asked about the different ways to replace missing teeth, so we thought it would be helpful to the people of the North Devon and the local Barnstaple areas if we took some time to explain this in our blog. We are therefore going to take an in-depth look at the reasons you might want to replace missing teeth (which may include some reasons you’ve never heard of before! ), we will also take a brief look at the various ways of replacing missing teeth and what the advantages are with each method. (More to come on this in more detail in a future blog post). It sounds obvious, but it’s rather true. Our smile is extremely important to the look of our face, take a look at these celebrities with their teeth deleted from the photographs… Your smile is extremely important and having missing teeth can change the way it looks completely. 2. Because other teeth can move around! Your teeth are all in fine balance with one another. Teeth rest in what is known as the ‘neutral zone’. This neutral zone is created by the teeth either side, the opposing teeth on the opposite jaw and your tongue and cheek. All of these put mild pressure on the tooth, all in balance with one another, all keeping your teeth in pretty much the same place. If this balance and harmony is disturbed, for example by removing a tooth, then the teeth either side will have a tendency to tip into the gap and drift. Your opposing teeth will also have a tendency to over erupt in to the gap. This moving of teeth can have a cosmetic impact. Take a look at the image above and notice that the premolar that has moved has changed the gum line on the upper jaw. This sensitive gum line architecture will affect how your smile looks if it is compromised. This is a direct consequence of the teeth moving as described in #2. If your opposing teeth drift then you may have to move your jaw in a slightly different way to ensure that the teeth don’t interfere with each other when you bite. This can be extremely subtle and you may not even notice that your natural muscles have changed the way they work slightly. One consequence of this can be that some muscles are overworked,. Because the muscles of your head and neck are all connected. this can lead to headaches and/or neck pain. A rather surprising consequence of having a single tooth removed! When a tooth is removed, it leaves a socket or a hole. New bone doesn’t fill up this hole, rather, what happens is that the surrounding bone collapses in to fill up the gap. This collapsing means you lose over all bone quantity in this area. This can have the impact of changing the line of your gum and also can compromise the placement of a dental implant at a later date if you so decide due to a possible lack of adequate bone. One way to prevent this bone loss is to have a dental implant placed, the dental implant then fills the gap where the tooth is removed and prevents the adjacent bone from collapsing into the space. Ways to replace missing teeth. The primary focus of this blog post is to answer your questions about why you should replace missing teeth, we will take a much more in-depth look at the various options in our next blog post., however, here is a brief summary. Dentures are often unpopular due to the fact that they are removable. Modern dentures however can often be extremely stable, beautiful and are often a perfectly acceptable way to replace missing teeth. Dental bridges have been around for many years now and form a permanent solution to replacing missing teeth. They will attach to the adjacent teeth, which form an abutment off of which the false tooth will be suspended. Dental implants are the most modern solution for replacing missing teeth. They generally offer the most aesthetic option as they can look as though they grow out of the gum like a natural tooth. Because they also support the surrounding bone and prevent bone loss they may also be considered the most healthy option. Further questions about replacing missing teeth? To help with all of your questions we have created a free guide, in it we talk about the various options to replace missing teeth, the procedures, the costs and what you can expect. The guide is completely free and can be downloaded by completing the form below. Should you require any further information about replacing missing teeth in the Barnstaple, North Devon area then please visit our website or request an appointment here. This entry was posted in Replacing missing teeth and tagged bone resorption, bridges, dental implants, Dentures, why replace missing teeth on 13th October, 2015 by Dr Donna Hill. Welcome to Trinity Dental Centre In Barnstaple! We, at North Devon, are very proud to announce the launch of our new website! This entry was posted in Blog on 3rd August, 2015 by Dr Donna Hill.